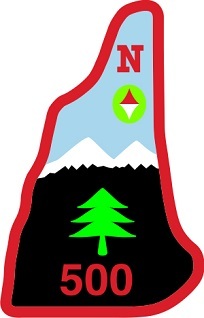 The objective is to climb to the summit of the 500 highest peaks of New Hampshire. Patches are awarded for the 200 highest (actually 203 highest), the 300 highest (actually 307), 2000 footers (473 peaks), and the 500 highest (actually 501 do to a 3 way tie in elevation). The reason for this is the elevation. The 200 highest list includes all peaks over 2900 feet. The 300 highest list includes all peaks over 2400 feet. 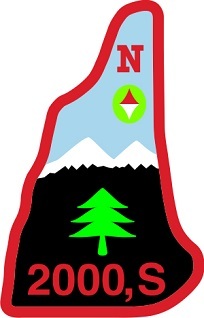 Click on the link below to download the list of New Hampshire's 500 highest peaks in a spreadsheet. * Note #1 - There is no Official NH 500 List. This is a best effort approximation researched and developed by Bryan Cuddihee. An addendum for this list provides additional options, possibilities, and "delisted" peaks visited over the years. This web page honors all finishers, past & future, of all versions of this list. *Note #2 - As stated there are other versions of this list. They are shared selectively and with some exclusivity. This version of the list is meant to be shared by all. *Note #3 - Names & alternate names for these peaks were retrieved from a variety of resources. Many "unnamed" peaks have "unofficial" names that were "coined" & "assigned" by previous trekkors & list makers. *Note #4 - This web page and this list is a "work-in-progress". It will occasionally be "tweaked" with additions/subtractions, name changes, etc. We welcome input & discussion from "All". *Note #5 - Some of these summits and peaks are Located on Federal, State, City, or Town owned properties. Some are located on private land. Please repsect all rules and regulations. If you cross private land, please respect the land owners' rights, obtain permission as needed, etc. *Note #6 - Due to private property and privacy issues any peaks located within Corbin Park are not required for the completion of these lists, and the awarding of the patches.